I never, ever posted this quilt I made for H for Christmas. It’s time I remedied that! Okay, actually this ended up being a New Year’s quilt since I didn’t actually finish it until December 30th. Remember grass? I’d forgotten about it under all the snow we got in January and February. I’m obsessed with this fabric by Aneela Hoey, I’ve been holding on to it forever now until I was ready to cut into it. Pretty proud of this binding, I learned a new trick from Carolyn in the Jersey Shore Modern Quilt Guild. 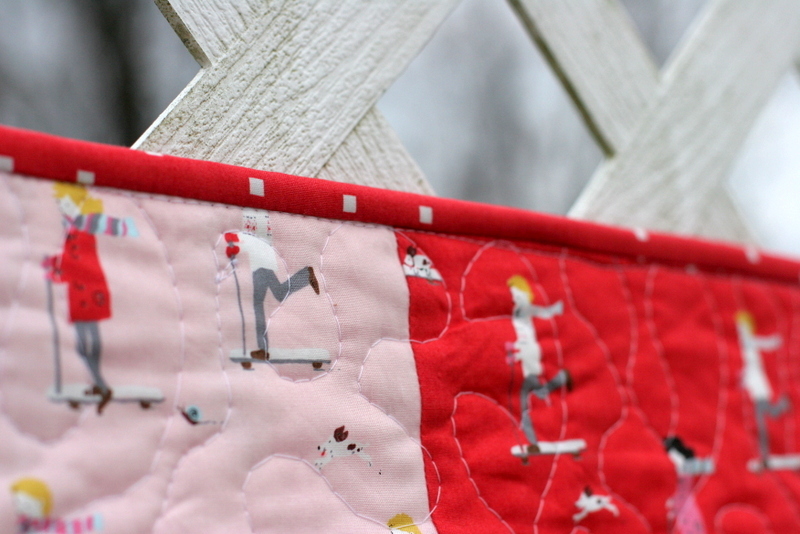 A meandering free motion quilting job. My favorite kind to do. I just used this print for the back, and I appliqued the label on this time. H has been sleeping under this quilt every night since. She definitely approves! 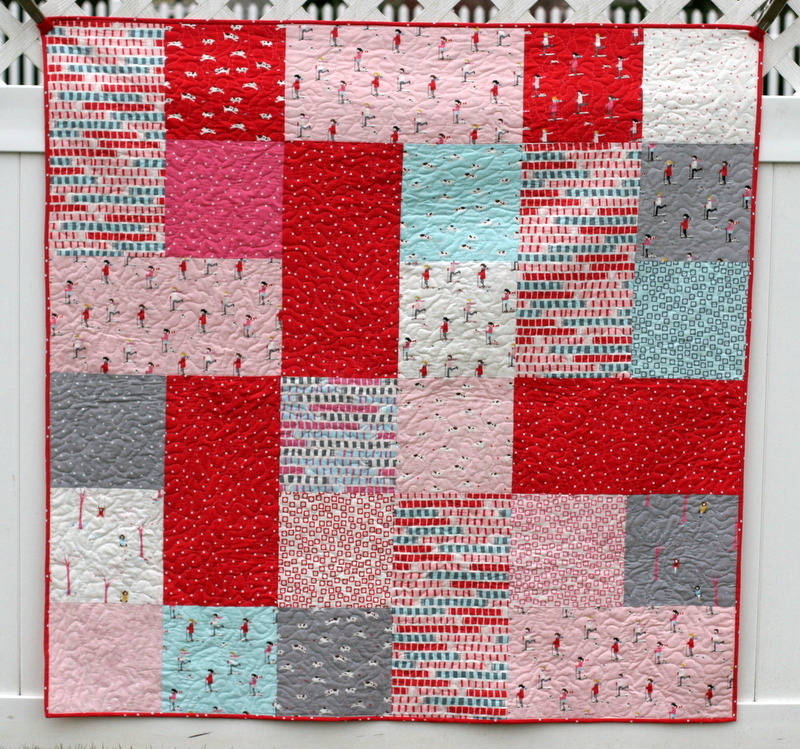 The finished quilt is about 60″ square, and I used a layer cake along with some longer pieces of yardage that were cut to be 10″ x 19.5″ unfinished. I pulled 18 squares I liked from the layer cake. 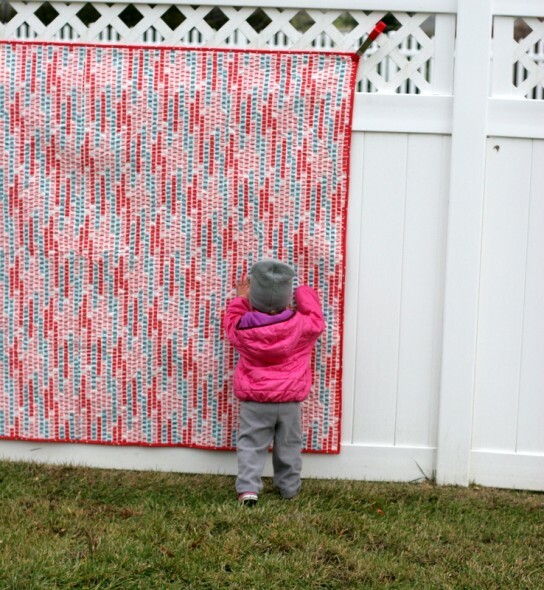 I had yardage in 3 coordinating fabrics (the pink people, the red dots, and the multi scarf stripe print). 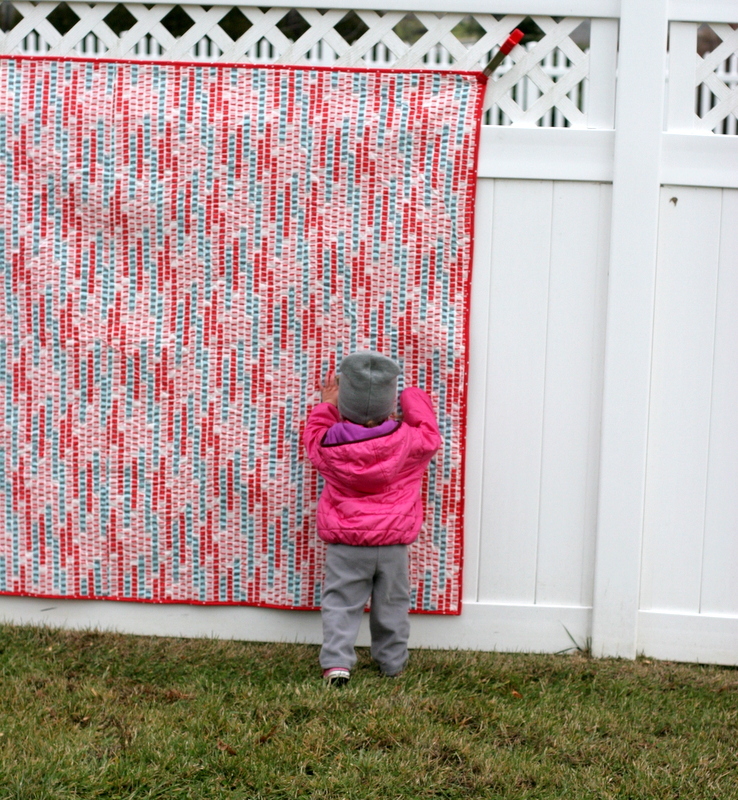 From that yardage, I cut 3 blocks in each fabric that measured 10″ x 19.5″. I pieced together 6 big square blocks by sewing two layer cake pieces to one 10″x19.5″ piece. This left me with 3 long rectangular pieces and 6 layer cake pieces. I sewed the layer cake pieces together into 3 pairs. Now I had 6 big square blocks, 3 single fabric rectangles, and 3 rectangles with 2 fabrics. They were all 19.5″ wide, so then I could start piecing the top. I arranged the blocks, the single rectangles, and the rectangle pairs into 3 columns. In each column, I arranged 2 big square blocks, 1 rectangle, and 1 rectangle pair until I liked the overall layout. 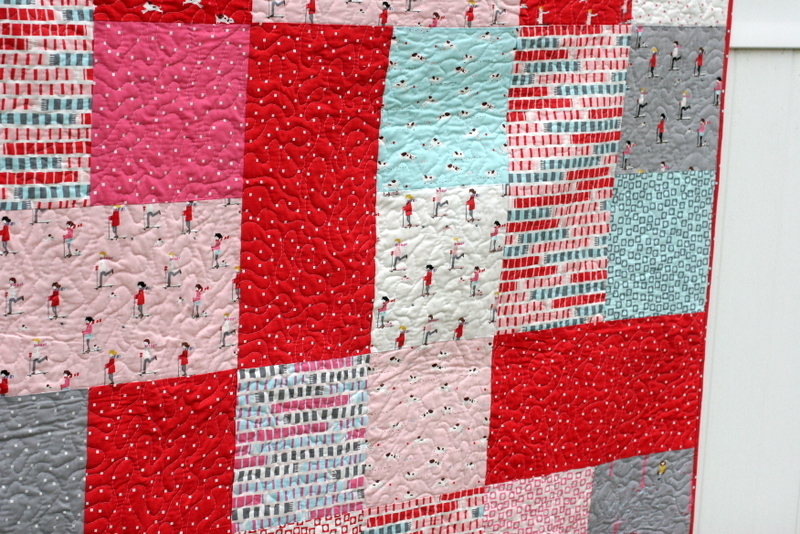 I sewed the 3 colums individually, and then I pieced the 3 vertical pieces together to make the entire quilt top. I quilted it and bound it in the red print. This is a super easy, basic quilt that can be pieced together in an afternoon. If you have the layer cake, you only need to cut out 6 other fabric shapes. The rest is all basic piecing, ironing, and trimming. 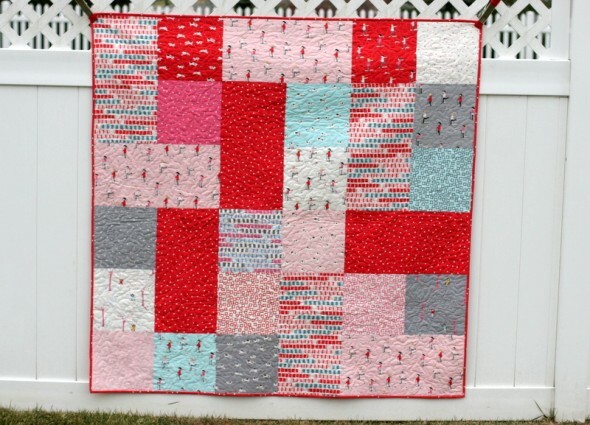 I think the red could be arranged a little more thoughtfully, but I still think this is a great wintry quilt. I have a nearly-two-year-old who thinks it’s pretty great, too. Works for me! Hey fellow GeekMom! I just found your website (why is that??) and I LOVE it. Bookmarked, of course. I just had to comment about this fabulous quilt. 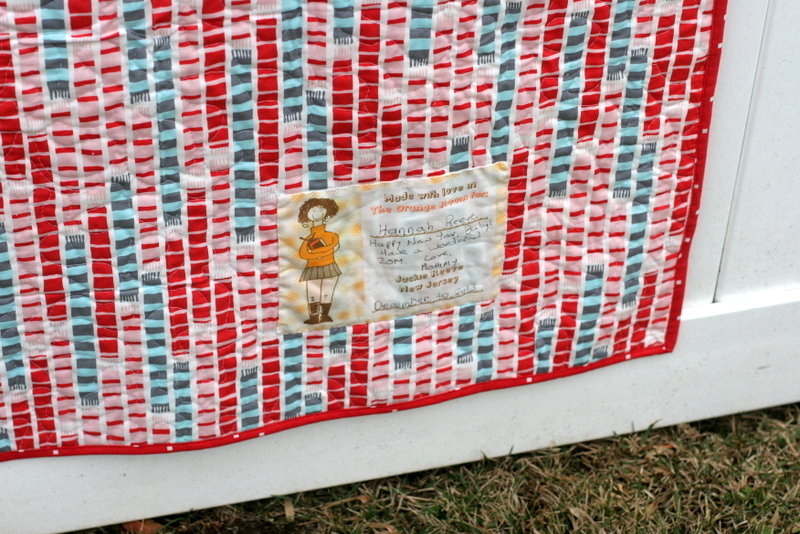 I taught myself to quilt, with library books, when my four kids were little. I LOVED picking out fun fabrics. To me, they were like art I got to buy and create with. Then I worked at a Joanns fabric for a few years…so dangerous! So many fun, new prints coming in all the time. 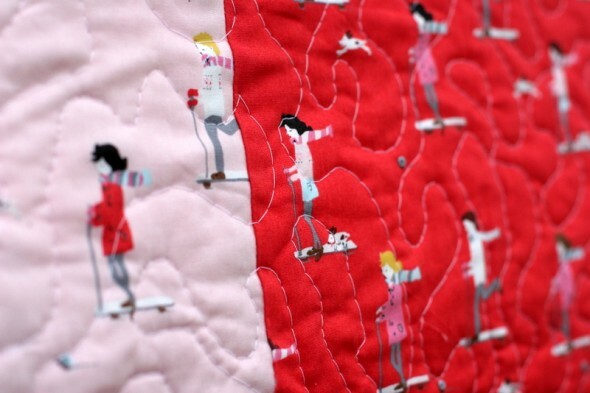 I think we have a lot of the same taste because this is the most AWESOME quilt I’ve seen in decades. Do you have a quilting machine? That’s the part that tripped me up every time. I loved the piecing, but hated the hand quilting!